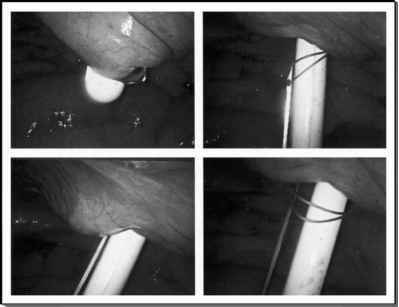 With the stone burden removed, the base of the diverticulum has to be examined for the communicating infundibulum, and methylene blue injected through the retrograde aEthicon, Inc., Somerville, NJ. bBaxter Healthcare Corp., Fremont, CA. 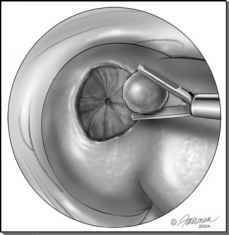 FIGURE4 ■ Removal of the diverticular stone burden with grasping forceps. The diverticular infundibulum may be readily identifiable. FIGURE5 ■ Retrograde injection of diluted methylene blue solution through the ureteral catheter can assist in identifying the infundibular connection to the normal collecting system. 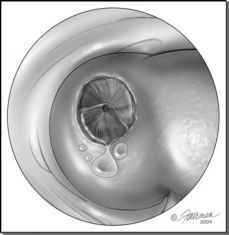 ureteral catheter (Fig. 5). One or two figure-of-eight sutures are placed across the infundibulum using 2-0 or 3-0 polyglactin on an RB-1 or computed tomography-2 needle (Fig. 6). Repeat retrograde injections of methylene blue are performed to recheck the integrity of the closure. Additional sutures may be added as needed. If the connection to the main collecting system is not identified, or if suture placement is not feasible, the base can be carefully fulgurated with monopolar electrocautery or argon beam coagulation.